In Red Hat CloudForms, an infrastructure provider is a virtual infrastructure environment that you can add to a Red Hat CloudForms appliance to manage and interact with the resources in that environment. This chapter describes the different types of infrastructure providers that you can add to Red Hat CloudForms, and how to manage them. The web interface uses virtual thumbnails to represent providers. Each thumbnail contains four quadrants by default, which display basic information about each provider. After initial installation and creation of a Red Hat CloudForms environment, add a Red Hat Enterprise Virtualization Manager provider to the appliance. Click Validate to confirm Red Hat CloudForms can connect to the Red Hat Enterprise Virtualization Manager. To collect capacity and utilization data, you must enable the capacity and utilization server roles available under Settings → Configuration → Server → Server Control. For more information on capacity and utilization collection, see "Assigning the Capacity and Utilization Server Roles" in the Deployment Planning Guide. To collect capacity and utilization data for a Red Hat Enterprise Virtualization environment, the Data Warehouse and Reports components must be installed in that environment, and you must create a Red Hat CloudForms user in the Data Warehouse database. Click Validate to confirm Red Hat CloudForms can connect to the database. Web Services: This tab is used for access to Web Services in Red Hat Enterprise Virtuaization Manager. You can set whether Red Hat CloudForms should use the Telemetry service or Advanced Message Queueing Protocol (AMQP) for event monitoring. If you choose Telemetry, you should first configure the ceilometer service on the undercloud to store events. 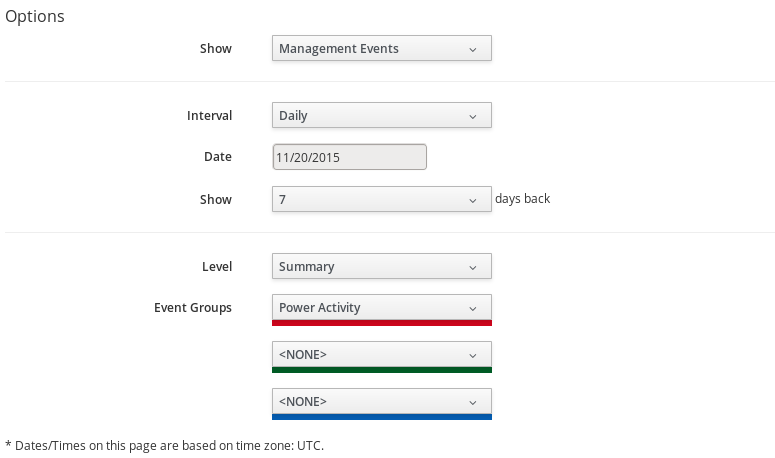 See Section 1.3.1.1, “Configuring the Undercloud to Store Events” for instructions. To use a Microsoft System Center Virtual Machine Manager provider, add it to the appliance and set up the SCVMM server for authentication. Before you can add a Microsoft SCVMM provide to your Red Hat CloudForms environment, you must enable WinRM to listen for HTTP traffic on Microsoft SCVMM servers. You must also set the appropriate execution policy on the Microsoft SCVMM server to allow PowerShell scripts from the appliance to run remotely. After initial installation and creation of a Red Hat CloudForms environment, add a Microsoft System Center Virtual Machine Manager provider to the appliance. Enter the pasword in the Password field. Provider Taskbar: Choose between Configuration, Policy and Monitoring options for the selected provider. Provider Summary: Displays provider summary such as Properties, Relationships, and Smart Management. Provider Summary PDF: Generates provider summary in PDF format. Provider Accordion: Displays details about Properties and Relationships for the selected provider.